Axon Enterprise, MGP Ingredients, and World Wrestling Entertainment have been outstanding performers. Over the last five years, the S&P 500 index has returned around 87%, including reinvested dividends, a decent performance by any measure. Yet investors could have done much better investing in any number of individual stocks, and it wouldn't have required taking fliers on risky penny stocks, either. Axon Enterprise (NASDAQ:AAXN), MGP Ingredients (NASDAQ:MGPI), and World Wrestling Entertainment (NYSE:WWE) all handily beat the broader index, generating total returns hundreds of percent higher, and the smallest of them has a market valuation north of $1 billion. So, let's take a closer look at how these three stocks would have turned a $3,000 investment in 2013 into at least $17,000 today. WWE Total Return Price data by YCharts. Five years ago, Axon Enterprise was called TASER International and was primarily making conducted electrical weapons, more commonly called stun guns, though it had just broken into the body camera and evidence database management market. Sales of Tasers represented over 92% of annual sales that year, though the body cam market held significant potential for growth. Today, after changing its name to something that reflects where it sees the future of its business heading, Axon now generates almost a third of its top line from body cams and evidence management, and the segment which houses them, "software and sensors," is the company's fastest growing revenue stream. The segment's sales rose 66% last year while Taser segment sales were up less than 16%. That torrid pace is continuing into 2018, with software and sensor sales up 58% over the first six months versus the prior year (and 72% higher in the second quarter), while Taser sales rose just 12% in the first half of 2018 (and 14% in Q2). Sales of new products have propelled the business and allowed Axon Enterprise to turn a hypothetical $3,000 investment five years ago into more than $17,000 today, as its stock has posted total returns of 473% during that period. If you drink distilled spirits, it's quite likely you've tasted MGP Ingredients' products without even knowing it. MGP is a contract distiller that has counted the likes of industry giant Diageo, which owns global brands such as Johnnie Walker and Crown Royal, among its customers. It does sell its own branded alcohol products under the George Remus, TILL American Wheat Vodka, and Tanner's Creek Blended Bourbon Whiskey labels, but in 2017, the company's five biggest distillery products customers accounted for over 23% of total net sales. MGP Ingredients has been carried along by the changing tastes of consumers, who have largely switched from drinking beer to drinking the "browns" of the spirits world, such as whiskey, bourbon, and rye. Data from the market analysts at Nielsen indicates that the high-end spirits business represents over half of all spirits industry volume, and nearly two-thirds of its sales. This "rising tide lifts all boats" factor has MGP Ingredients flowing on a whiskey river, and with total returns of 1,250% over the last five years, a $3,000 investment in this contract distiller would have turned into $40,500 today. That's a result investors can raise a glass to and toast. Image source: World Wrestling Entertainment. 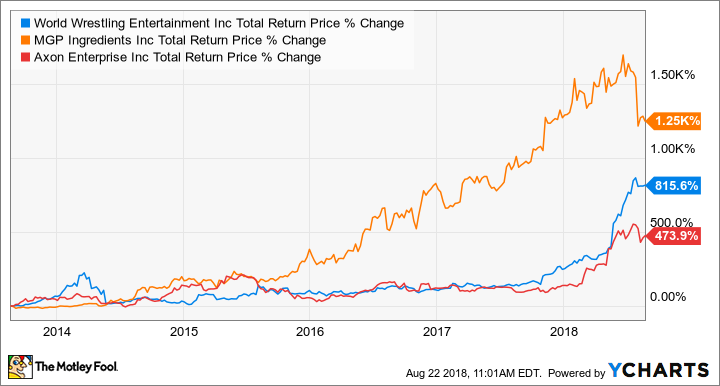 Few stocks have been as hot this year as World Wrestling Entertainment, which has seen its shares rise 158% year to date, while posting five-year total returns of some 816%. That would give investors almost $27,500 today had they taken a $3,000 bet on the pro wrestling circuit back in 2013. While most of WWE's returns have come this year as the entertainment company signed a deal with Fox Sports that is four times larger than the one it previously had with NBCUniversal, it highlights the value of having patience when it comes to investing. When a company is otherwise successful and is searching for the right catalyst, simply biding your time can be your greatest strategy. World Wrestling even features a modest dividend that yields a little bit more than a half percent annually for your trouble. What's key for investors is that the benefits of its new agreement won't fall through to WWE's financial statements until next year, suggesting the growth it's seen may not be over. That's not to suggest its stock isn't expensive -- it is based on traditional metrics -- but with the potential for overseas growth to follow, World Wrestling Entertainment may yet body slam its critics.